Obesity can affect anyone but especially those with one obese parent. The risk of obesity increases if both parents are obese. 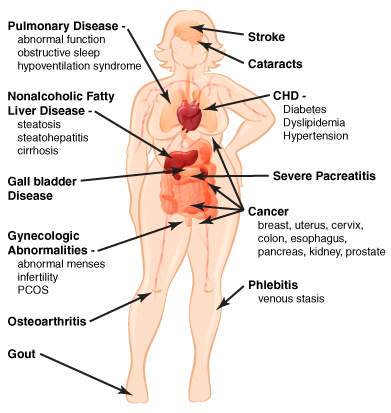 Obesity as a disease is caused by several factors such as genetics, the environment, hormonal imbalances, and nutritional imbalances. More than a third of US adults are obese. Increased body fat both directly and indirectly promotes and/or causes adverse health consequences and thus, by definition, is a disease. Overweight and obesity are linked to more deaths worldwide than underweight. That means that 65% of the world’s population live in countries where overweight and obesity kill more people than underweight and/or starvation. Short Term 6 Week Special Extended!